Disadvantages: Most incredibly complex sprue layout seen yet! When the Soviet Union began to mechanize in the late 1920s they found themselves at a loss for motorized transport and cargo vehicles. As a result a purchasing committee went abroad and bought both vehicles and rights from foreign companies to “kickstart” production. Two of those chosen were the Ford Model AA 4 x 2 Truck and the Model AAA 6 x 4 truck. Both trucks were rated as 1.5 ton cargo capacity vehicles and were new to Soviet factories. The Gor’kiy Automotive Factory (GAZ) was given the task of converting them over for production under Soviet conditions - mostly the conversion to metric measurements but also other changes to make them suitable for their factories. The GAZ-AA entered production in 1932, but it took a bit longer for the GAZ-AAA due to the changing of the design of its Timken axles to Soviet production methods. But unlike the AA, the AAA was not a license built model due to a failure to get an agreement with Ford and thus did not share as many parts with the AA model as hoped. The new truck, which entered production at the end of 1935, used the Ford AA engine of 40 HP (later 50) with a four-speed transmission and two-speed transfer case to provide eight speeds. In service the GAZ-AAA was used for a wide variety of tasks, such as 120mm mortar tractor, fuel tankers (bowsers), radio and electronic systems, the heavy armored cars BA-3, BA-6, and BA-10, and finally armed variants. 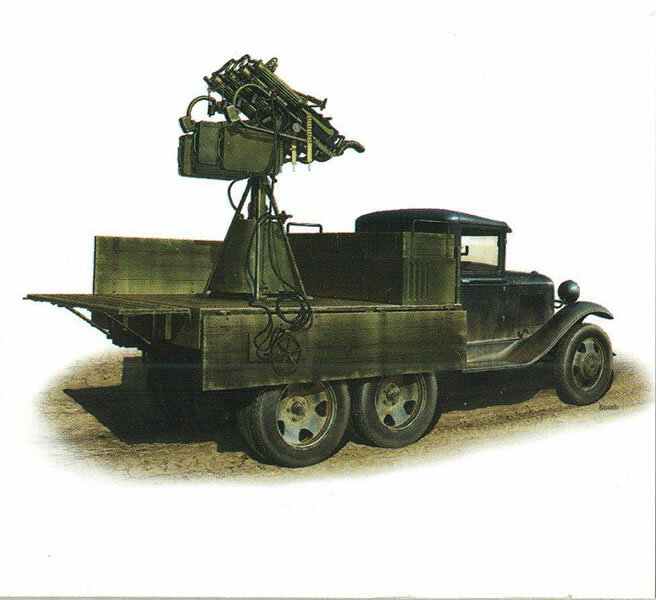 The first armed variant was the antiaircraft version which went into service in 1938. This version mounted either four 7.62mm Maxim Model 1910/30 machine guns or in some cases four 12.7mm DShK machine guns on a single mount in the center of the bed. Later versions also carried the 25mm light antiaircraft gun. The vehicle had the capacity to carry the guns, a large amount of ammunition, water cans for the guns, and the crew. About 15 years ago a company from Russian named TOKO released kits of the GAZ-AA and GAZ-AAA trucks. They were nice, simple, quick build kits – the GAZ-AAA for example consisted of 142 parts in grey styrene, 9 clear and 12 black vinyl tires. But as noted they were simple kits and while eminently serviceable would need a lot to match current standards. Miniart released its GAZ-AA and GAZ-AAA kits a while back, but I was finally able to pick up this kit at the 2015 IPMS USA National Convention. I have been a fan of Miniart kits for some time and this one does not disappoint. The kit provides a truck kit with nearly 600 parts to it, four nicely done Maxim guns, the mount, 20 ammo cans (five set for use), lockers and seats when the body is closed up. While not listed in the parts list a 1mm (.040") wire is included for use with the cooling water hoses to the cooling jackets was not provided in the kit. The directions are very complete – 88 steps – which is good, as with all of the sprue subsets it is a very complex model to sort out - 23 of them to be precise! Parts counts run from 102 down to only one though, so it is easier than it seems at first. Assembly starts with the engine and frame, and as noted all parts are called out by their sprue and subset. As the Ford engine was pretty simple so is the one in the kit - 19 parts. The frame is far more complex with separate spring hangers and other fine details to attach. Happily since it used a modified Timken axle there is a pass-through power transfer and only one drive shaft arrangement is needed for alignment. Each tire consists of seven thin layers to achieve tread depth definition and there are four different wheel hubs that must be used - two front wheels with drums, four duals and spares. Assembly is very straightforward other than the wide number of sprues and a nice touch is the etched GAZ badge for the radiator shell. The cab interior includes the shifter, transfer case lever and all three pedals plus the spark advance and adjustment on the steering column. Doors include inner and outer handles, window cranks and full windows. The hood and the doors may be shown in optional open or closed positions. The body is complete with all frame braces, underfloor lockers, and braces. The inside of the body receives the ammo locker with the ammo chests (provided) and tool and equipment stowage under the seat lid (not provided). Assembly of the 4M mount begins with Step 63 and covers the base, ammo chests and rotating mount rack for them, machine guns, and the communal mount and cooling water feed needed by the guns. All four guns are linked together for simplifying the feed of cooling water to the jackets in combat. Protective muzzle caps with etched brass chains are also included. The cooling hose is quite long to permit traverse (and extra cooling and feeds from the base mount which serves as a supply tank. Overall the machine gun mount takes some 169 parts by itself and is only about 2" long, 2" wide and 2.5" high! Six different finishing options are shown; all have a 4BO green body and black chassis unless other painting is indicated. They include (1) Moscow November 7 1938 parade (whitewall tires); Summer 1941 (3B AU paint with white circle and black 8); Summer 1941 - Northern Front (unknown unit, no markings); AAA mount, 43rd Rifle Division, 50th Rifle Corps, 23rd Army Northern Front (white rectangle with white 5/76); Unidentified unit, Summer 1941 (circle with white Cyrillic S); 50th Rifle Corps, 23rd Army, Northern Front August 1941 (white 2). A small sheet of decals is provided for these markings. Overall this is a very nice kit and while complex the truck is really a nice complement to the jewel-like machine gun assembly. Note that if you have an resin 4M kit (such as Resicast) it could also be used on the older TOKO if you do not want to deal with four times the parts!